If we’re going to be writing anything useful, really we need some capitals and some numbers. Back in lesson 1 I talked about the repeated shapes within an alphabet helping to make it look pleasing and rhythmical. In the same way, we’d like our capitals and numbers to feel like they belong with the lower case letters we’ve been working with. So that doesn’t tell us exactly what they’ll look like, but it’s a good clue. 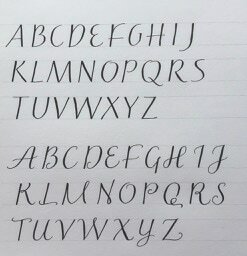 Here’s the capitals and numbers I’d like to develop to go with my alphabet. They’re not fancy with flourishes and twiddles all over the place, but then neither are my lower case letters. They work nicely to give a modern, stylish look, which is easy to write – perfect! I've added a second alphabet/number set underneath. These have some "extras" giving them a free look. But have a careful look - they're still quite plain with a small number of extras - more than this and it starts to look overdone. I left the "fancy" 8 in - I wasn't happy with it - particularly because it looks like an overdone S. I prefer the plainer example on the right. This is just the sort of playing and evaluating you get to do too. Over to you to have a try. First make sure you can do the simple shapes, then you can start add something extra. You need to decide on some capitals and numbers that will work with your alphabet. Don’t agonise over it – try some shapes out, and if there are letters you don’t like, you can always change them! With my alphabet I’d like you to write a list of 26 girls’ names, one beginning with A, one with B etc. And you guessed! With your alphabet I’d like a list of 26 boys’ names! Send them in when you're ready.